Every one inside the dorm room was already in deep slumber as I lay on my bed. It was just funny because I was freaking scared to turn on the lights so I just went to bed with denim on. As I recalled my experience with the Singapore Immigration back at Changi Airport, I remembered that I haven’t had a decent dinner yet. My tummy agreed with a rumbling sound so I got up and started my search for my first Singapore food. 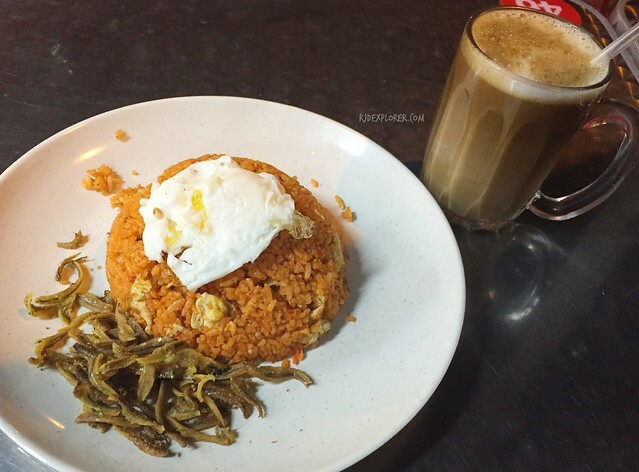 Nasi Goreng Kampong (SGD4.5) and Kopi Cinno (SGD1.8). Luckily, the famous Kampong Glam Café, on the corner of Bussorah and Baghdad Streets, is open until 2AM. A crew immediately approached me and handed the menu. My eyes instantly rolled to check available rice meals. Several “nasi” options are available and I got a Nasi Goreng Kampong (SGD4.5) and a cup of hot Kopi Cinno (SGD1.8). It was funny to know that the cold version is pricier than the hot one, probably because of the ice being added. Nasi Goreng was my first ever meal outside of my country. As far as I remember, I enjoyed the salty fried rice and anchovies with flavor toned down by the sweet Kopi Cinno. After the dinner, or midnight meal rather, I went back to my hostel full and satisfied. The coffee made me awake for several hours. Hainanese Fried Bee Hon (SGD5.5). Next meal I tried was a plateful of Hainanese Fried Bee Hon (SGD5.5) in Killiney Road, a restaurant just across Hotel Kai. Another amusing event was when I couldn’t understand what the cashier was saying with regard to my order. It was too late when I finally decipher the cluttered words; she was actually asking if I’m okay with pork meat. My single order went a bit longer but a dish with overflowing fried noodles became my reward. Spices cover the noodles with plethora of ingredients from shrimp, cuttlefish, pork meat, fish cake, tofu, and bok choy. The meal also came with a spicy sauce which served as my dip for the ingredients. The explosive flavors recharged me from hours of walking from Orchard Road back to my hotel accommodation. Makansutra Gluttons by the Bay was my planned dinner destination on my first day in Singapore. After the long walks from Marina Boulevard to Gardens by the Bay to Helix Bridge, I found a lot of kababayans, both travelers and overseas workers, share over sumptuous but pricey meals. It was ecstatic to see a stall of Gerry’s Grill offering grilled stuff. 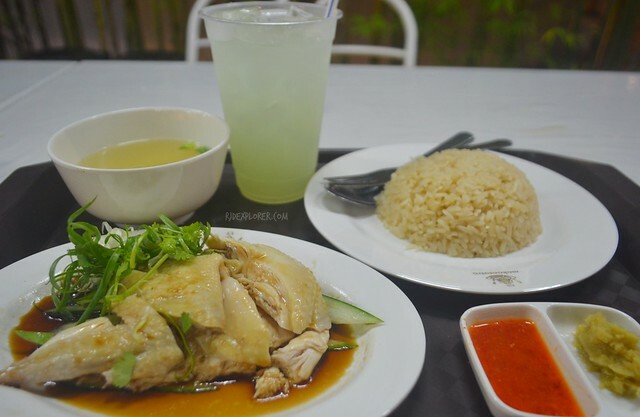 Hainanese Chicken Steamed Rice (SGD5.2) and lime juice (SGD1.8). I surveyed the few stalls and joined the queue for Wee Nam Kee, not sure if it’s related with the restaurant brand in Manila. Queuing time tested some of us because the first stocks were already sold out and supply was still on its way. Hainanese Chicken Steamed Rice (SGD5.2) and a lime juice (SGD1.8) served as my dinner. It’s the national dish and one of the must-try Singapore food on a list posted on a wall in Five Stones Hostel. The meal had the chicken on a separate dish swimming in sauce, a scoop of Hainanese rice, a saucer with chili sauce and ginger paste, and a bowl of soup. Fishball noodle soup (SGD3.5) and barley drink (SGD1.5). Universal Studios Singapore’s thrilling rides caused my late departure from the theme park back to my hotel near Bugis MRT Station. A restaurant near National Library of Singapore became my short haven to combat my starving stomach. I decided to avail a bowl of soup even if I saw their chef put the noodles dropped on the counter back to the noodle cooker. I effortlessly chow down a bowl of fishball noodle soup (SGD3.5). Rice noodle topped with fish cakes and fish balls with the soup on a separate bowl. 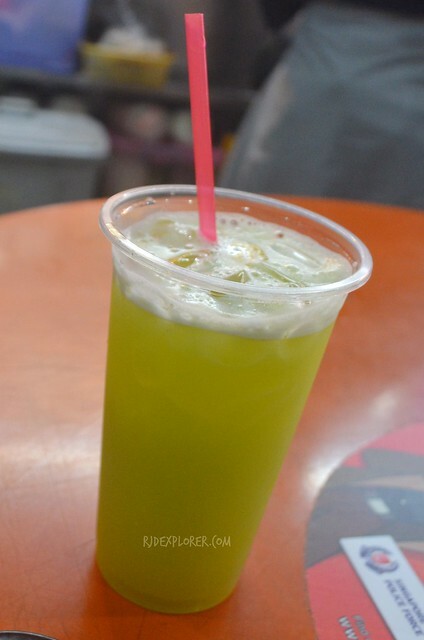 A refreshing barley drink (SGD1.5) quenched my thirst. 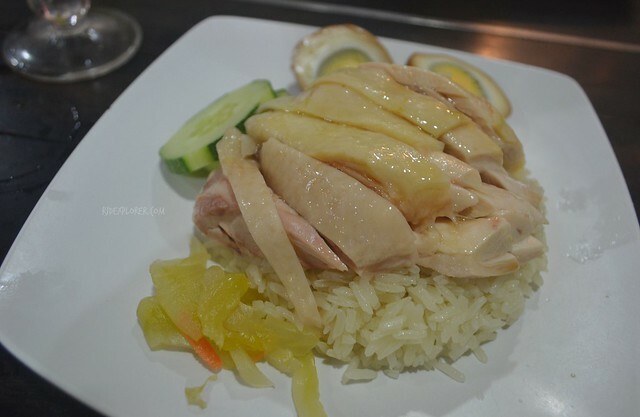 The Jew Kit Times’ Hainanese Chicken Steamed Rice, (SGD4.8). When I met a friend in Beauty World MRT Station, I was happy to know that she planned to bring me to a famous restaurant serving Hainanese Chicken Steamed Rice, The Jew Kit Times. I didn’t refuse even though I already had one in Makansutra because I wanted to try a different one to have varietals. Turned out that it was better than the first one. The meal was also cheaper at SGD4.8 served with boiled eggs. 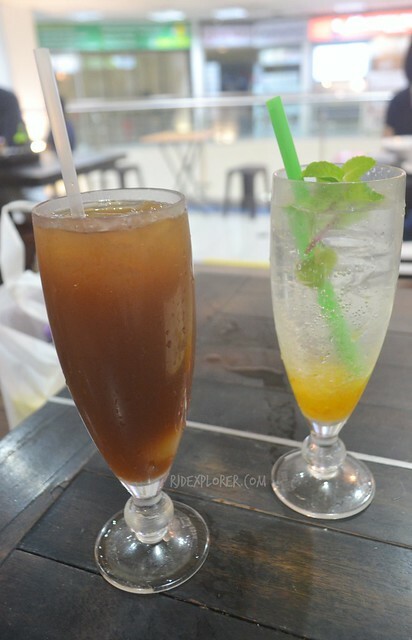 We shared stories while devouring the juicy steamed chicken and sipping on cool drinks like the Honey Longgan with Melon (SGD2.3). Maxwell Food Center is a famous hawker center in Singapore and it will be a failure if I won’t try it myself. I actually had all my meals in Maxwell during my last day. The center has dozens of stalls offering kinds of food from Chinese, Singaporean, Thai, and Malaysian. But I wasn’t able to check if there’s a booth serving Filipino food. For lunch, I got a bowl of the savory laksa (SGD3), popiah (SGD2.5) that was recommended by a Singaporean who shared a table with me, and the colorful ice kachang (SGD1.5). 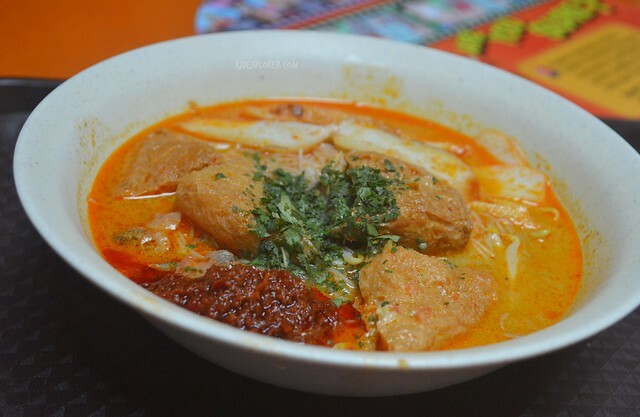 If you will ask me what Singapore food I’ve tried I will recommend best, without a blink of an eye, it will be laksa. I’m a noodle freak and the food is like the Ilokano’s miki that I’ve grew up with. The difference is that the broth of the laksa was more flavorful and spicy, plus the abundant toppings. 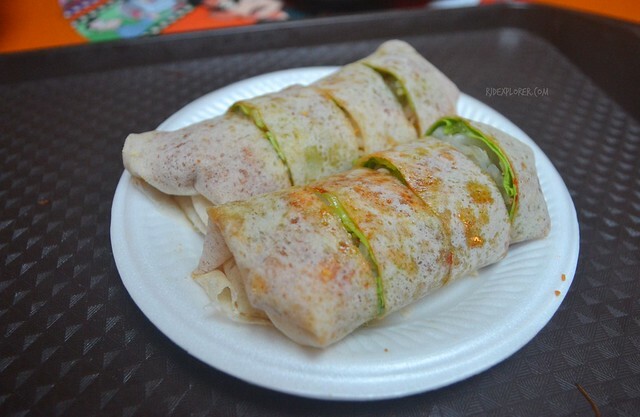 Popiah is a spring roll like Filipino’s fresh lumpia. The main disparity between the two is the hint of a spicy sauce for the first that really warped the sweet nutty taste. 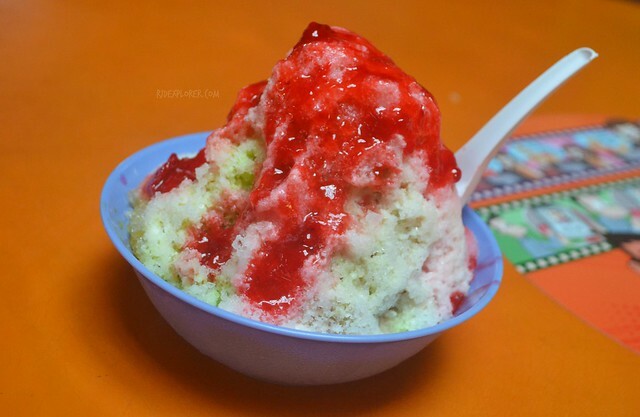 At first I considered the ice kachang as simple layers of shaved iced drizzled with fruity syrup. But eventually, I found out that it has beans, jelly, corn kernel, and nata de coco. With that, Filipino’s halo-halo is the best opponent to consider. It was a hefty lunch for me and spending a total of SGD7 wasn’t that bad at all. For dinner, I went back to Maxwell Food Center and had my food fix for the day. It was already 9PM and most stalls were already closing. I went around once and got myself 8 pieces of steamed dumplings (SGD4), satay bee hon (SGD3.5), and a freshly squeezed sugarcane drink (SGD1.5). The dumplings didn’t taste like the common ones in the Philippines. It’s a bit sweet and has an aftertaste of coriander, if I’m guessing it right. Nothing fantastic but I loved the ginger sauce. 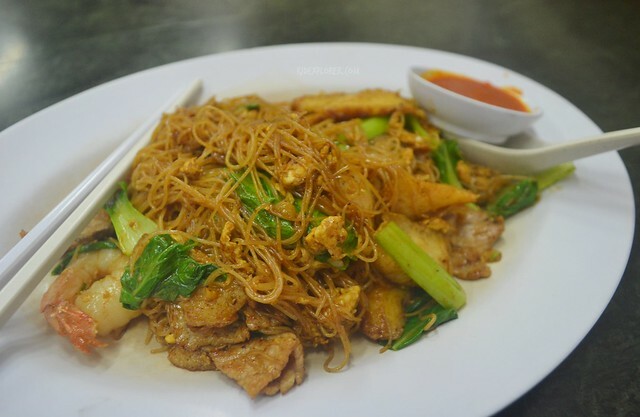 Satay bee hon is simply vermicelli noodles with cuttlefish, bean sprouts, pork, tofu, and prawns. Its main ingredient is the satay sauce that entirely covered all ingredients on the plate. I hate sweet sauces especially on noodles and this is not for me. Before I left the hawker center, I bought another barley drink that became my favorite quencher during my stay, kudos to the barley sinkers. For you to enjoy the culinary landscape of Singapore without breaking your pocket, always dine at hawker centers. 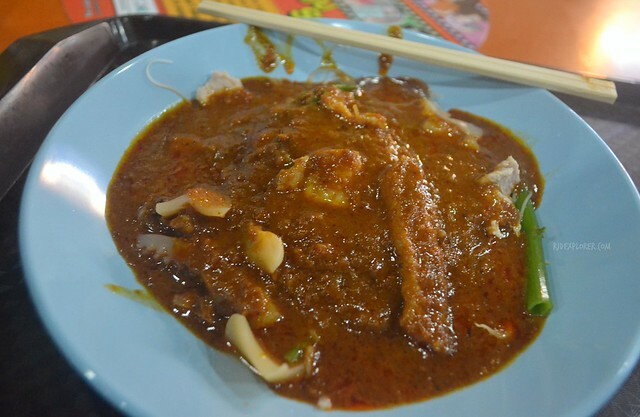 To try the best meals, don’t hesitate to ask for suggestions from locals where to avail the best laksa or chili crab. Sometimes, it’s also nice to spend some time joining long queues as these line will be your ticket in having the best meal to fill your rumbling tummy. In total, I spent SGD59.6 for my Singapore food budget on my 5-day stay. It was a great food experience on my short stay in Singapore. There were some items I weren’t able to tick off from my list but what I’ve had really exposed me to the diverse culinary offerings of the city-state. It is also notable that some Singapore food has a counterpart on our own with just minor variations that probably a product of the different cultures. PS#1. Don’t forget to try the famous ice cream wafer. 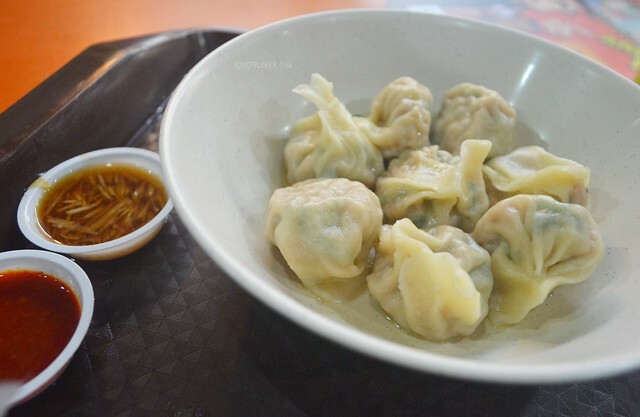 Peddlers in Chinatown offer the street food with several flavors at SGD1.2. Friar’s Goodfood’s Prawns and Calamari at SGD10. PS#2. I need to confess that I’ve spent more than SGD6 for a meal and it was the saddest one I had in Singapore. 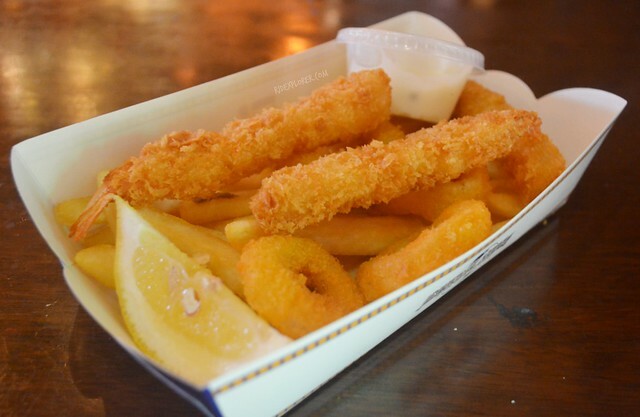 During my stay at Universal Studios Singapore, the cheapest option I was able to find was Friar’s Goodfood’s Prawns and Calamari at SGD10, without a drink. Considering the meal, it was pricey. Well, you’re inside the USS.